The present lot is superbly conceived and very original in its design. Added to that, the flawless stone and the outstanding technical quality of the carving and polish, the censer is among the most impressive in the Hartman Collection. A similarly designed censer is in the Palace Museum, Beijing, illustrated in Zhongguo Yuqi Quanji, vol. 6, no. 122 (fig. 1); while a teapot with a more protruding ram's head as the spout is in the National Palace Museum, Taiwan, included in the Special Exhibition of Hindustan Jade in the National Palace Museum, 1983, illustrated in the Catalogue, pl. 74; and another with a cloisonne enamel overhead, trifid handle is in the Palace Museum, Beijing, illustrated in Jadeware (III), The Complete Collection of Treasures of the Palace Museum, Hong Kong, 1995, pl. 216. Although the present censer appears to be unique, the use of the ram's head as the main subject is well-documented and most likely, originates from Mughal jades. A famous Hindustani jade cup with a foliate lobed rim and a ram's-head handle, dated to 1657 and previously belonging to Shah Jahan, is now in the Victoria and Albert Museum, London, illustrated by Geoffrey Wills, Jade of the East, New York, 1972, p. 157, no. 137. 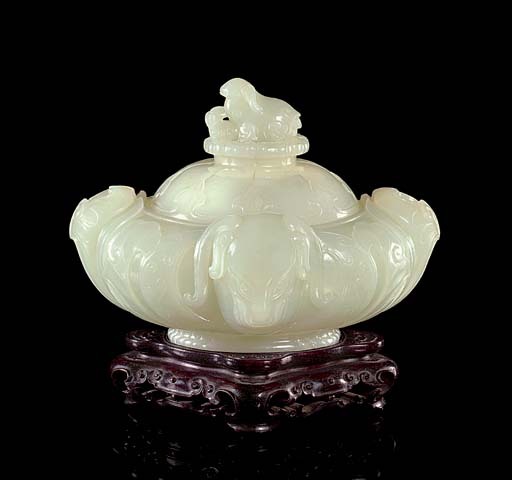 From there, an 18th-century Hindustani white jade version was made, based on the 17th-century original; cf. op. cit., National Palace Museum, Taiwan, 1983, pl. 25. Subsequent copies of this form by Chinese lapidaries were created for the Qianlong emperor's court, where the interesting shapes and exotic nuances were appreciated. Chinese-made water-coupes with ram's-head details include one in the National Palace Museum, illustrated op. cit., Taiwan, 1983, pl. 80; and another in the Palace Museum, Beijing, illustrated op. cit., The Complete Collection of Treasures of the Palace Museum, 1995, no. 161.